Spain. | La Rosilla - Lifestyle and food. Never will I tire of ‘Tapeando’ with friends and family, this is the art and I like to call it that, of enjoying Tapas from one place to the next. A small bite and a copa de vino or Jerez, standing at a bustling bar, or in the market. Maybe indulging in a little lengthier time and sitting at the table an ordering, yet just another to fill the spot, or to sample the new delicacy or gastro tapa to be served. From simple but tasty local cheeses and olives to mindblowing molecular gastronomy to please the most die-hard foodie like myself or Masterchef in the making. Malaga delivers on every count, and never disappoints with new innovational bars, alongside cultural and historical institutions of food. A recent visit with friends, with slightly aching feet, we decided on a one-stop Tapas lunch at the renowned El Tapeo de Cervantes this intimate and cosy restaurant, which is located in the heart of the historical Malaga centre, just steps away from the Cervantes theatre and Picasso’s Plaza Merced, delights with its traditional interior and extensive and exceptional menu of Tapas. 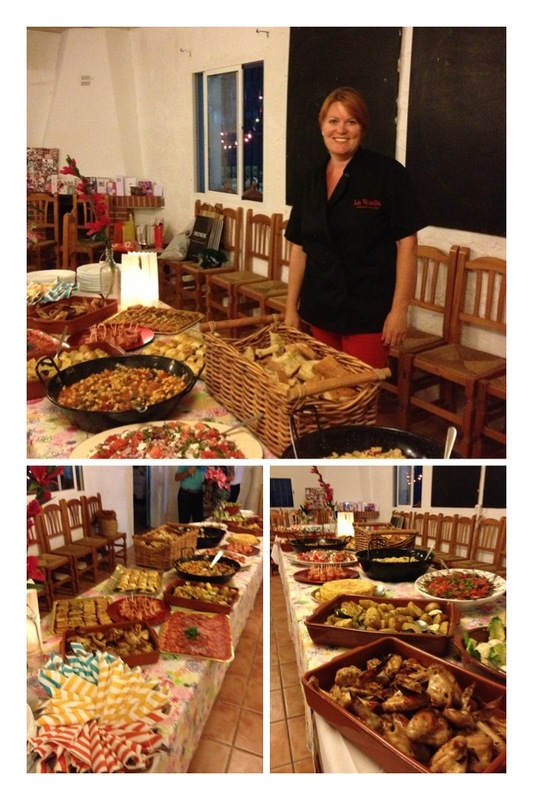 They offer tapas of every guises and taste, listed in an informative way so diners can create their own perfect ‘Tapeo’, if overwhelmed by the choice and you don’t know where to start, let the professionals choose for you. We did this, not overwhelmed persay, but with 3 differing tastes, we thought let’s go out of our comfort zone and see what they serve. WOW – Course after course arrived at our table, tapas and raciones (larger plates) of seafood, fish, pork and, duck, enjoyed with a chilled Albariño and a robust Ribera Del Duero. Each exquisitely plated and served with flair and introduction. As each dish was delivered there was a moment or two or me wondering ‘How much is this going to cost’…I was paying 😉 But on the delivery of the bill, feeling very indulged and complete, I was delighted – 3 people, 6 Glasses of wine, copious tapas. 65€ !! Perfecto 🙂 Not many cosmopolitan cities in the world, where you can experience that luxury and service on that budget. Duck with apple & five spice. Leaving the restaurant on a chilly but bright winter afternoon, we needed to walk off our long lunch, obviously taking in Picasso himself and taking the obligatory photo for my friends, to complete their whistle-stop tour of my inspiring and beautiful city of Malaga, with promises to return. 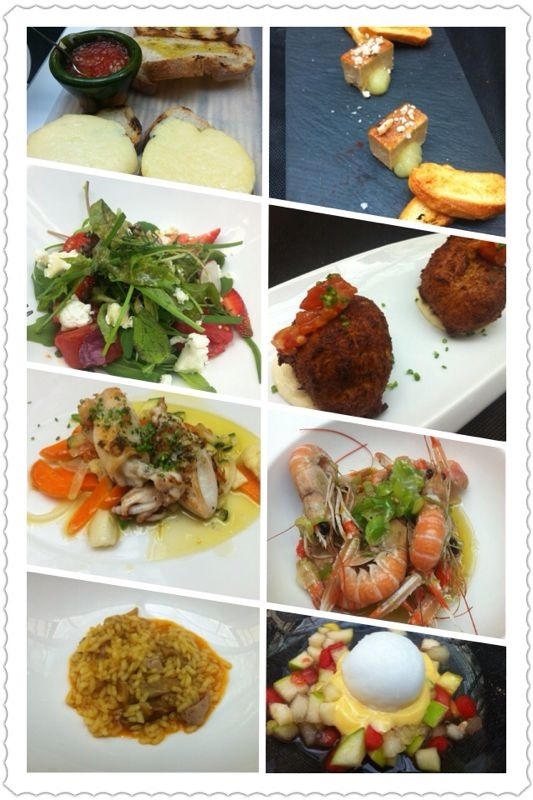 Malaga Cooking & Culture Tours. I can’t believe it’s over a month since I’ve written, well I can actually, time has flown and life has been hectic, good but hectic. Food creations have been a little on the back burner and lifestyle more upfront. 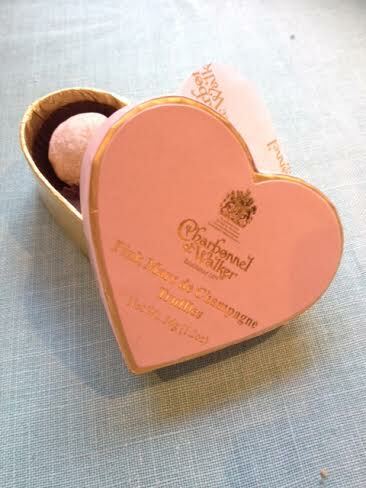 I’m not saying we haven’t indulged, we have but on a more makeshift and mend, rustic style. Cooking on open fires, eating alfresco, picking salad leaves from the patch, shopping day by day. Why ? because we had our first guests renting La Rosilla for the season, and we pack up and move to our much humbler shack on the mountain. It is very picturesque but has no electricity (hence no posting) and only cold water, and washing up outside, think camping but with a roof over our heads ! Fortunately the weather was kind to us, which made life a great deal easier. 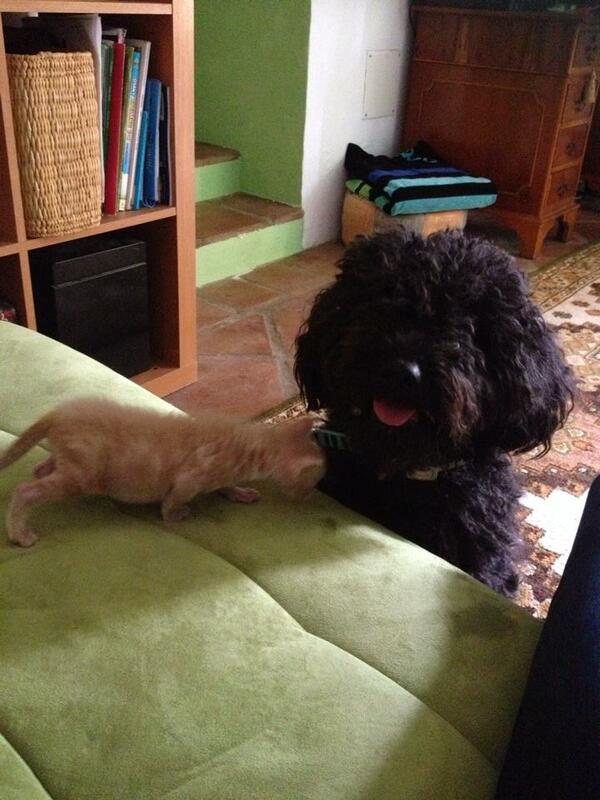 Whilst living out of our suitcases, our kitten that we are hand rearing, has grown from strength to strength now nearly 6 weeks old, he is weaned and starting to explore , keeping the dogs entertained and us of course. I’m now thankful that the sleepless nights of 2 hourly feeds are over, and proud that we have succeeded in the task . He has traveled with us over the last 6 weeks, wherever we’ve been, the beach, parties, camping and to work. Our mountain animal menagerie is growing again. We have another pony on the way, that we have rescued. Inca will be joining Tika on the mount, for TLC and a better life. I too have got back in the saddle after 25 years, my nerve or bravery seems to have diminished though . I’m hoping my confidence builds as I get used to it again. I’m looking forward to hacks and rides with my little daughter and exploring new paths ,tracks and vistas, with a picnic or two. This week-end we took part in our first Romeria, (Spanish Horse Fair), along with our friend and teacher Sharon. 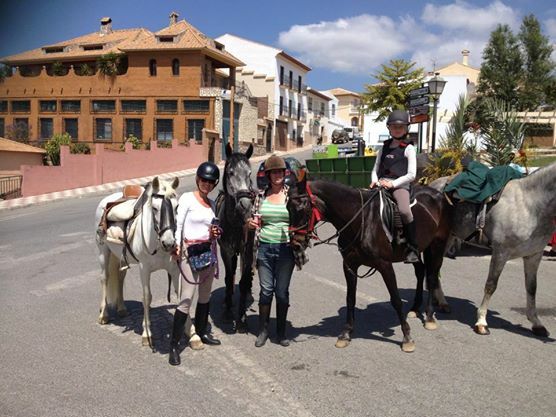 We were the only female riders amongst many Spanish men and their stallions !! 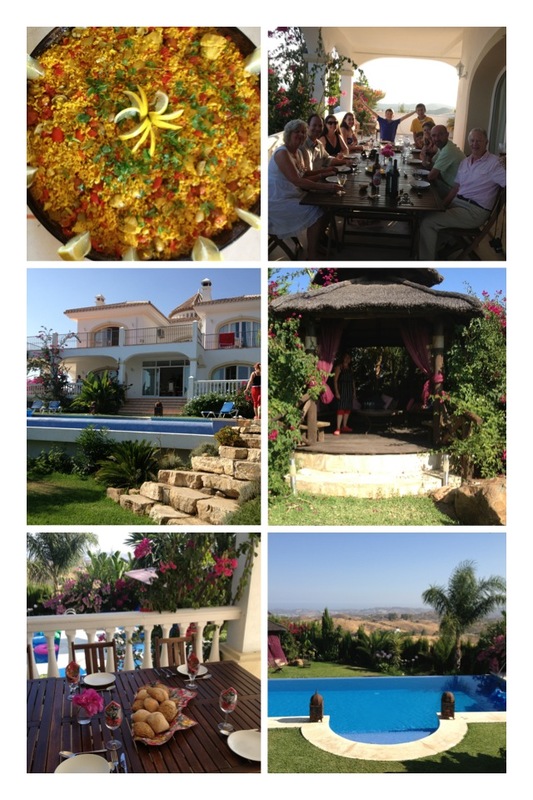 A great day riding and partying, flamenco and traditions with local musto, embutidos , paella and snails !!!! for all those who rode. 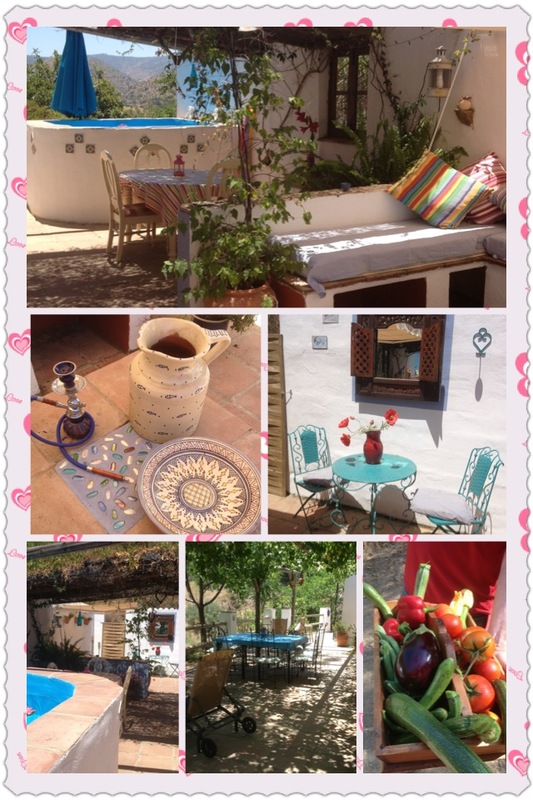 So once more settled back in at La Rosilla, I can re-focus and get creating again . Recipe books out and being browsed, to get back on my #cookfromthebooks wagon challenge with menus being planned for guests and visitors. The veggie patch is growing well, and courgette flowers almost ready for picking and stuffing, vine leaves fresh and green too will be hopefully ready to be harvested at the weekend to be turned into delicious dolmades. The first figs our Brevas, and plumping and turning colour nicely – Oh the joy of mouthwatering home-grown ingredients. So from us all at La Rosilla humans and animals, Spencer, Rizo, Fanny (dogs), Baba, Rocket, Nutty (cats) Tika & Inca (horses) and Hens aka lovely ladies. 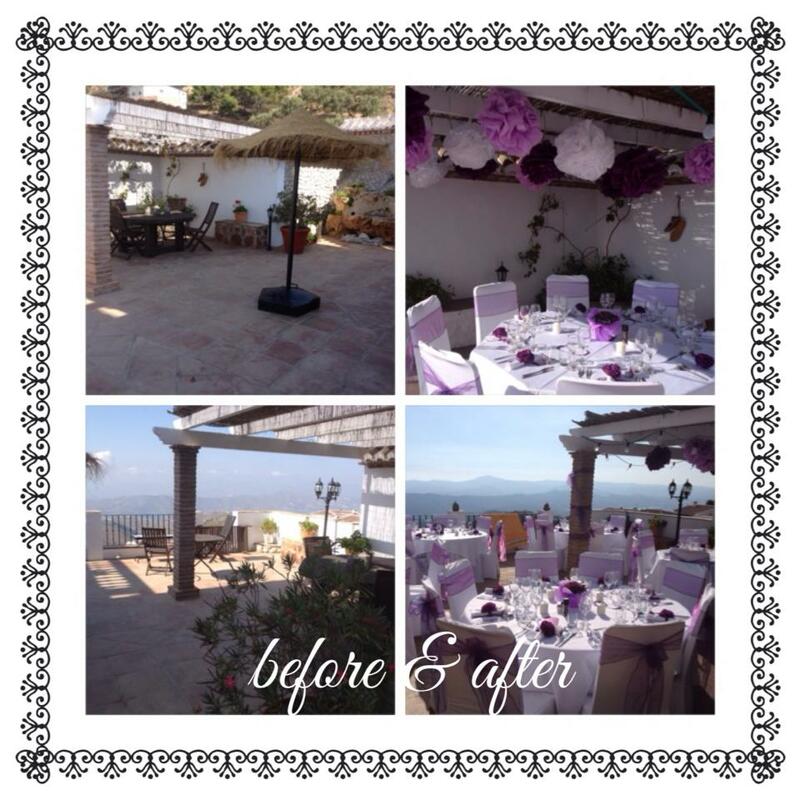 I was recently chosen to cater for a young Danish couple’s mountain top wedding here in Spain, a location that was close to their hearts from childhood holidays. 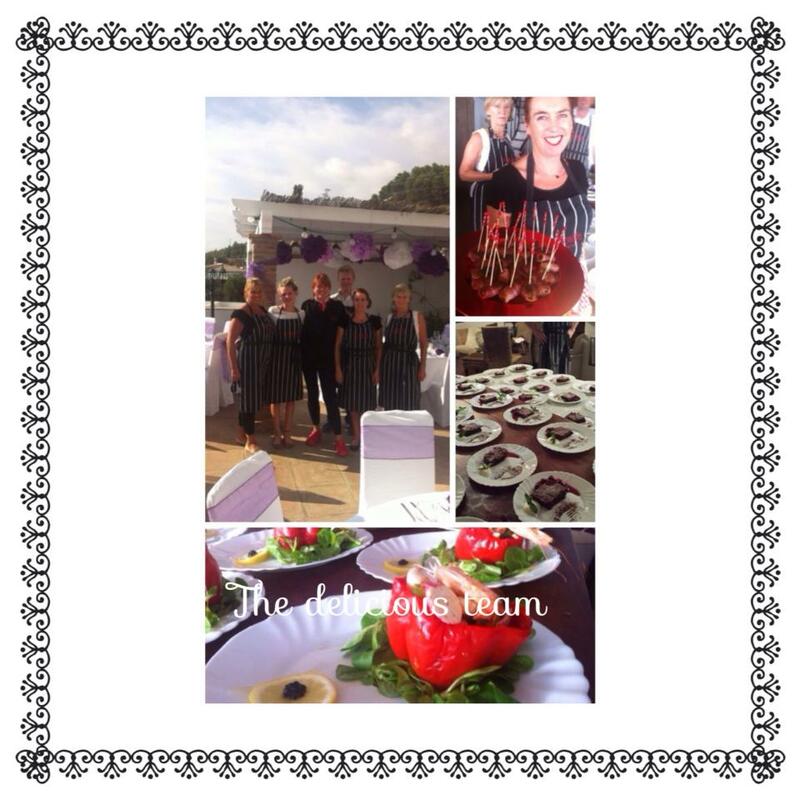 They picked me after reading this blog and seeing that my passion for ‘The good life and food’ suited their personalities and way of life, the Bride a top Pastry Chef and Groom Champion Triathlete. They wanted a menu that would represent the area, the sea ,countryside and the seasons and above all be fresh and home grown. The wedding was to be filmed (no pressure there then) for a Danish ‘Fly on the wall’ documentary, that is following the couples life for the next 7 years. 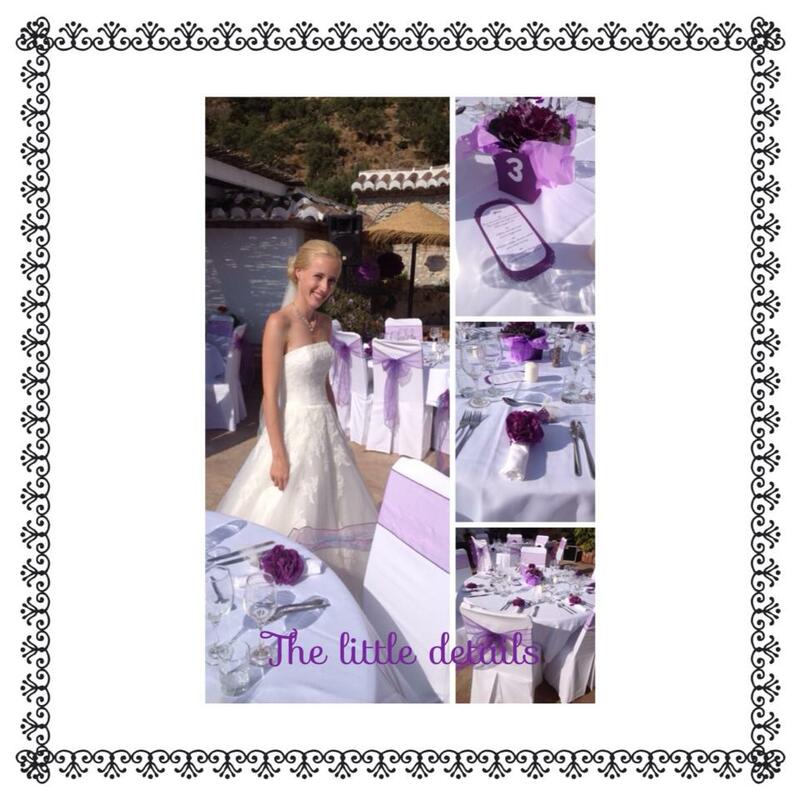 It was an honor to create for them and the location was breathtaking, high up in Tejeda Montes of the Axarquia, with views to the sea, lakes and whitewashed villages beyond. Vegetables and herbs were picked form the La Rosilla garden, pork was sourced from my local town of Colmenar and sea food from the abundant coast of Malaga. 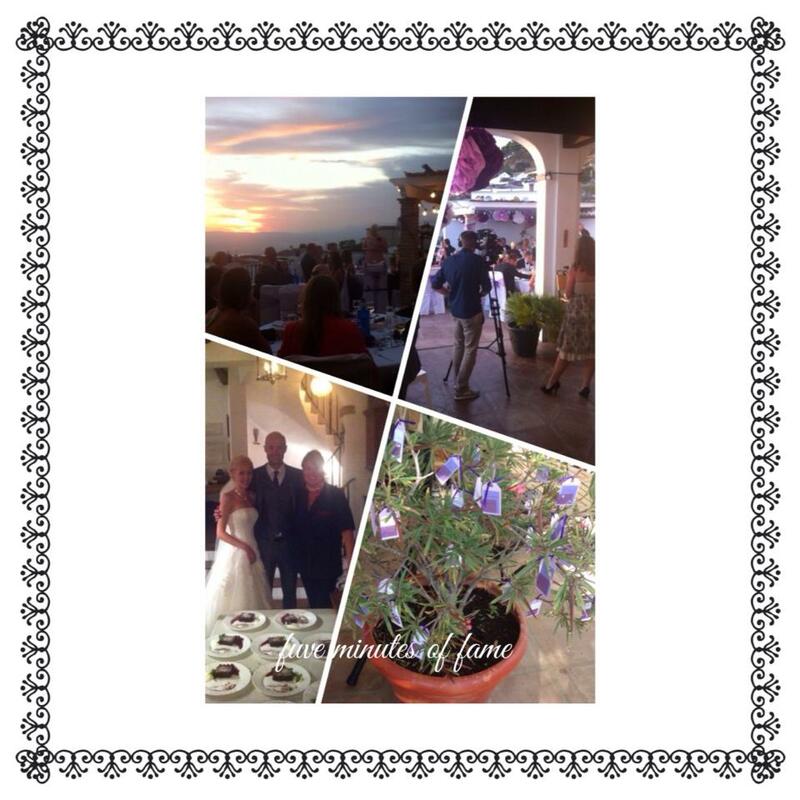 A spectacular terrace, had a wedding makeover, and was the backdrop to welcome guests with Harpist and flautist, an array of cocktails were sipped with canapes of, Beetroot Gazpacho shots, Bacon wrapped almond stuffed dates and Goats cheese tostados witch caramelized onions. The Danish wedding traditions were followed throughout with Speeches and toasts a many. The wedding supper, was enjoyed under the setting sun, and through the candlelit night. A taste of Spain, and another memory moment made. Oh my goodness, I really am sitting here with time to write . The first time in many weeks, even months that I can think it´s now time to jot down, make note and remember why I´ve been so busy . Not that I haven´t enjoyed the hectic, manic, crazy summer months we’ve had, but headless chicken springs to mind ! I relish the long summertime the children have off, I love being surrounded by them, grabbing the odd hour or day when we can dash off somewhere, and do Spanish summertime things, beaching, exploring, bbq´ing , entertaining, feria´ing. What firsts have we done , what have we achieved ? We met Alpacas, who took me for a walk . I cooked for 150 people over 4 days from 4 different continents. We went diving as a whole family, exploring the natural reefs of the Costa Blanca. Slept on a deflating airbed for 2 weeks. I gave cookery and culture days to travelers from Philippines, Australia, USA and Belgium. 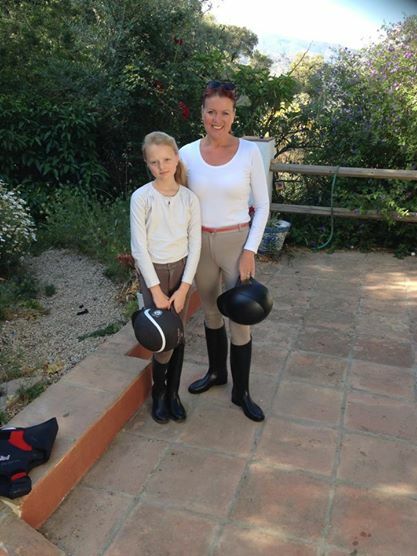 We had guests hiring La Rosilla from Prague, Holland and England. 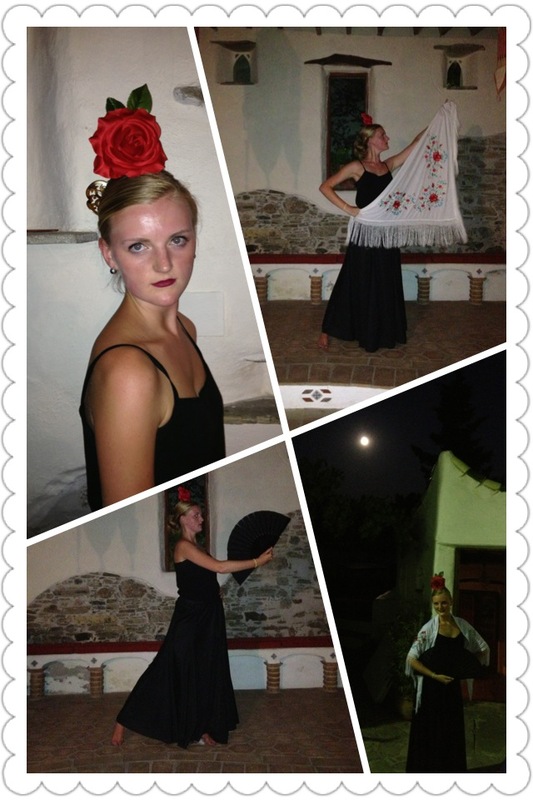 Flamenco La Rosilla. Homegrown entertainment. 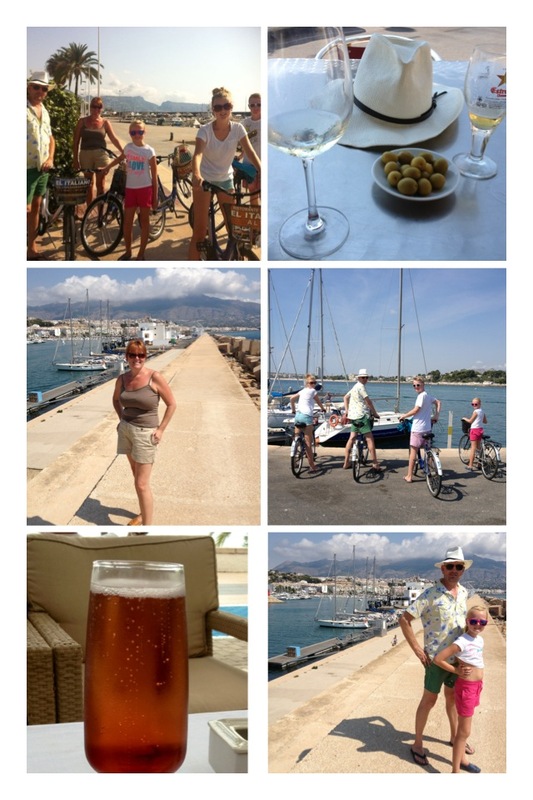 We hired bikes and explored the coastal paths. Cooked in 11 different kitchens. We hosted a cultural work exchange student. We moved out, moved back in, moved out, moved back in. To write down what we´ve done, makes me feel like a child, on my first day back at school and the teacher saying ´What did you do in the holidays´and I would often and sit and think ´oh my what did I do ? Well I know I burned the candle at both ends, felt at times I was going mad, ate some fabulous food and quaffed some wonderful wines, laughed, cried, ranted and raved, was surrounded in organised chaos most of the time, but by gosh it´s been a gud´un. Have I stopped for breath, I can’t remember. Living to the max, using every hour of the day, dashing in and out of weather, making hay whilst the sunshines – May has been marvelous and complete madness, so a few words and lots of photos will sum up my life on the mountain and beyond this month. 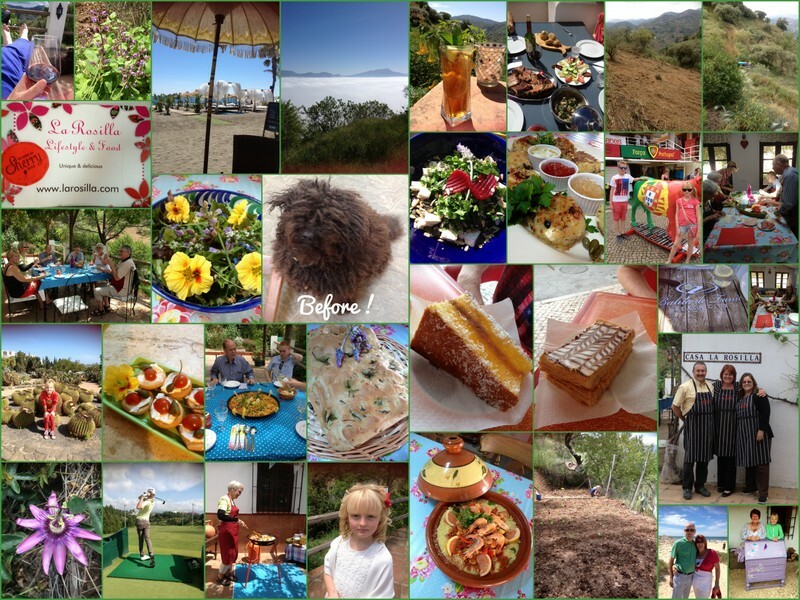 Gardening, tagines, planting, cooking, decorating, exploring, golfing, Portugal, cream cakes, beaches, herbs & flowers, home -made bread, communions, paella, pimms, clouds, haircuts, bbqs, ploughing.. 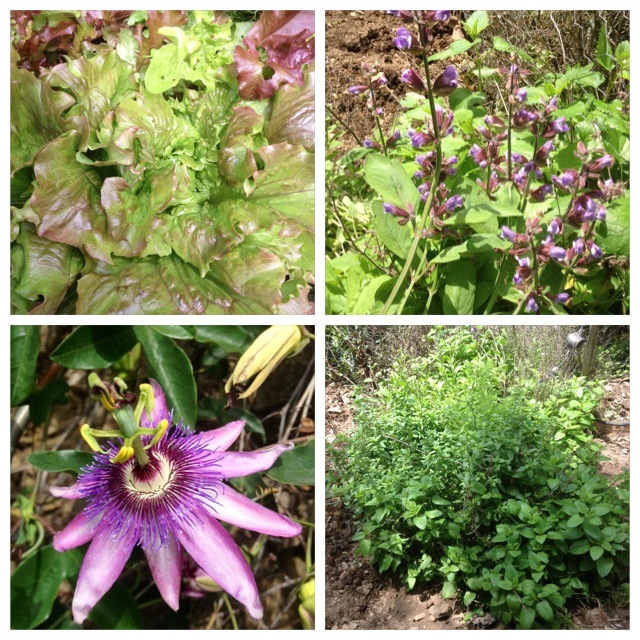 Being able to grow our own fruit and vegetables at La Rosilla, was always top on our agenda when we moved here. We have had huge learning curves, successes and disasters on the produce front, mostly weather related and getting used to the seasons and rugger mountain soil. Last year unfortunately I was unable to manage my large plot, due to a back injury, so I had to watch it go to seed and weed – I did plant a mini plot just by the backdoor, for lettuces, herbs,radishes and peas, so we have still been able to enjoy fresh picked goodies. 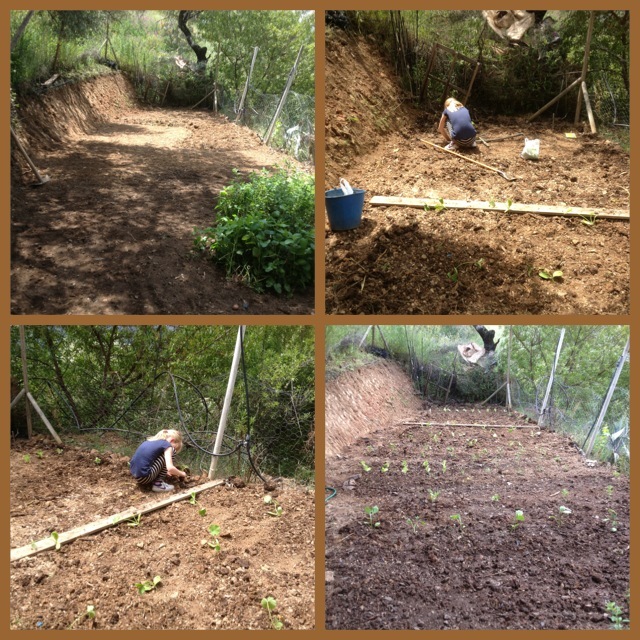 This year I’m happy to say, with the help of my young Spanish vecino (neighbour) a day’s hard graft and load of the finest mule and goat manure, our patch was back to it’s former glory and was ready for planting. Nellie and myself have planted and sown, lettuce, cucumber, tomatoes, courgettes, beetroot, french beans and mange tout, watermelon, peppers red and green, aubergines and carrots. The herb section has fortunately stood the test of time and neglect, so our lemon balm, oregano, thyme & sage are romping away nicely. Nellie has her own area, that she will tend and nurture & pick. We also have some new members of the family, 4 more happy hens, clucking and scratching and enjoying a life of free wanderings. What a great way to start a week, mind you I didn’t think that this morning, when I got up and it was so chilly and the car had no fuel. I made a mad dash to Colmenar to rectify this, even though I was spitting feathers as it was 18km there and back in the wrong direction to where I was heading… Note to self * Forward thinking* . But the shone was finally shining again, and the air was crisp and clear, and today my group ‘Views from the Hills‘ was meeting up for a mountain trek. First things first, we met at El Duende in Los Ventorros, an Aladdins cave of all things calm, Ruth was waiting for us, with fire roaring, hot coffee & delicious mango & apple cake, to give us the necessary strength to go on our way. New members came along, visitors too, from the Cheq republic, coming to enjoy the dramatic scenery we have on offer. Boots on, dogs raring to go we began our climb up Mazmullar , following ancient mule tracks, and paths carved out from running waters. Flora & fauna, in its early stages of re-growth after the recent rains, wild herbs of fennel and lavendar, lined our way. View points gave us respite and breath gathering time. The summit a plateau, is home to ancient ruins and caves, used throughout history for shelter and hiding. 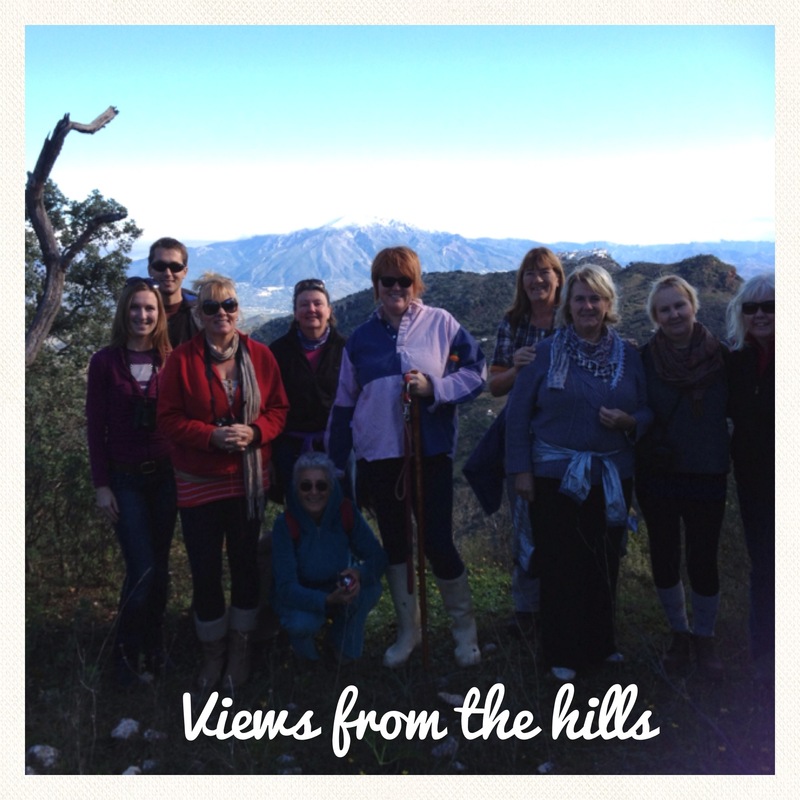 We climbed over rocks to pinpoint our homes on neighbouring hills, and marveled at snow on the peaks of Maroma, and the Moorish town of Comares perched high on it’s rock. Our descent was leisurely, and we enjoyed the warmth of the sun on our faces, returning for a wholesome lunch of homemade soup & bread in beautiful Moroccan bowls, alfresco in November , oh and a little more cake for good measure. Well I suppose we had to have it eventually, and have it we have – continuous rain & storms since Monday, I’m deluged in water at La Rosilla & last night we had the most spectacular electric storm, keeping the house awake all night. The thing is our idyllic setting, is just so in all seasons when it’s dry, but now matter how well we prepare, it’s never quite enough, to stop natures force of never-ending rain when it starts. So today on the mountain I have been digging ditches & getting soaked in P.J’s & pink hunters, trying to persuade the water flow, to take not such a devastating course . Located half way up a mountain, the water only goes one way, & that is down to the river at the bottom of our land and it doesn’t go slowly but at full force. Check it out here – La Rosilla fairy garden, water feature. 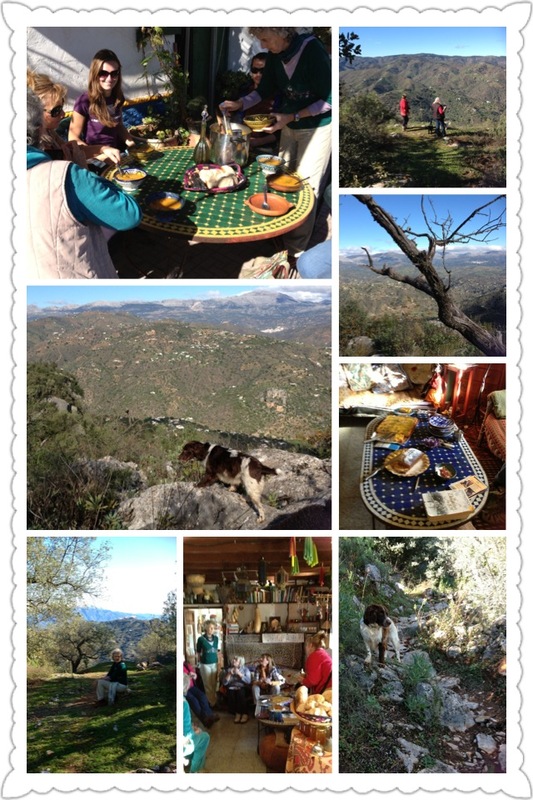 So today at La Rosilla we have had wet dogs & that delightful, NOT ‘eau de pouch’, Kitty & Cat not wanting to venture out – A drenched ‘Me’ with backache and mud encrsuted nails, from shovelling ….. and two ravenous children about to return home from school. 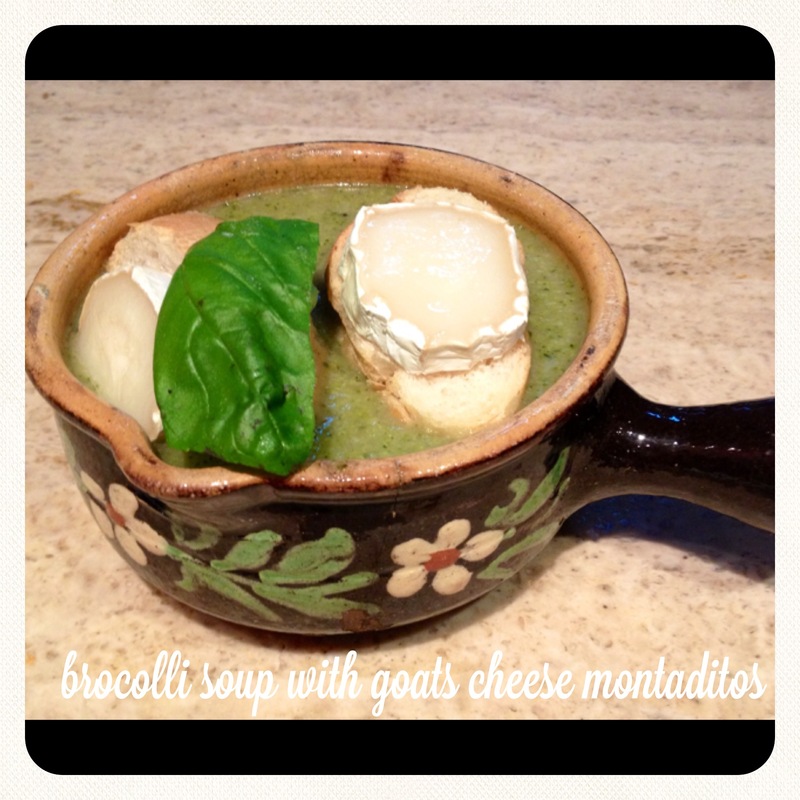 Only one thought for lunch …It’s a home made soup, kind of a day …. 1 head of broccoli, floretted ( such a word ? you know what I mean 😉 ) and stalks chopped . Stalks added to onions . Hot chicken or vegetable stock about 1 1/2 litres poured over. Simmer until stalks al-dente . Then add, broccoli florets , and simmer until just cooked and still lovely and green. Whizz up with a hand blender & season with Salt & Pepper. That’s it , easy ! 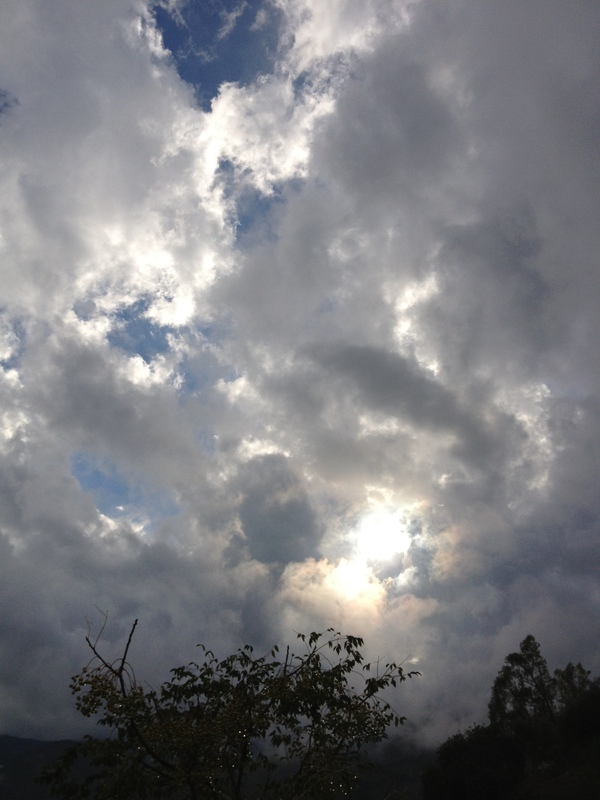 As I type the rain has taken a breather, but the river torrents are still flowing and the clouds on the mountains in view are hanging low, but hang on a chink of blue & a ray of light. Buen fin de semana todos stay dry !